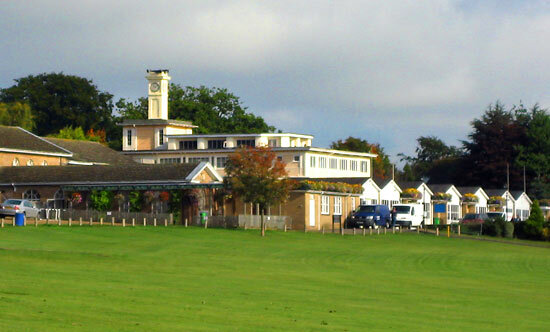 Location: The Pavilion, Wicksteed Park, Kettering, Northamptonshire, UK. 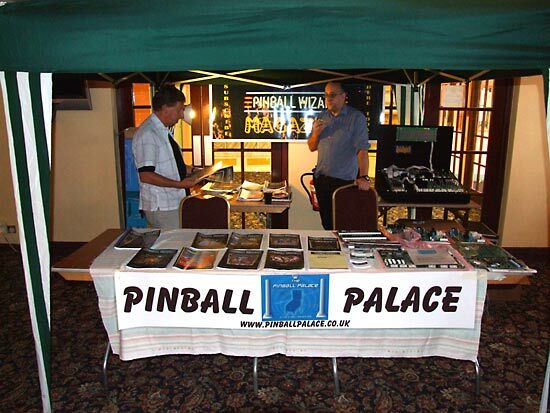 This was the fourth annual UK Pinball Show which meant it was time for the country's pinball community to converge on Wicksteed Park in Kettering for another weekend of casual and competitive play, machine and parts sales and meeting friends old and new. 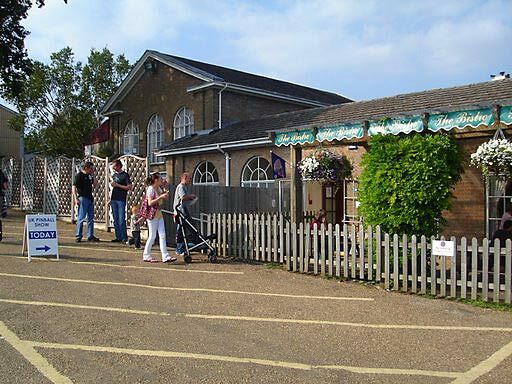 Wicksteed Park is a family-oriented theme park with a number of fairground rides, a kids playground, food stands and some water rides, all set in 147 acres of English countryside. This gave any non-pinball players in a group something to occupy their time while the pinball fans could enjoy themselves indoors. The last show was eleven months earlier and due to a prior booking it had to be set up very early on Saturday morning before the public arrived. This time there was no such restriction, so around midday on Friday vans started to arrive and disgorge their contents of machines, parts and equipment into the Pavilion building. Like one of the vans, the show was driven once again by Pinballers Anonymous's Nick Bennett who spent many months working on the layout, all the equipment needed, vendors stalls, publicity and promotion and ticket sales as well as transport arrangements and a new addition this year, a Saturday night dinner. There was some concern that a malaise may have set in and people were taking the presence of over 100 pinball machines for granted. With only a couple of weeks to go, the list of pledged machines was stuck stubbornly below 80. Once the vans started unloading though, it soon it became clear that number would be safely exceeded and in fact the total would end up well over 100. A second year at the same venue meant the the layout was familiar, as were the power requirements. Andrew Harris and Film & TV Services specified and supplied the necessary cables and connectors while Andrew and Keith Donaldson made sure everyone had the electrical supply they needed within easy and safe reach. Being able to set up during the day on Friday meant there was a chance to open the doors to the public at 7pm on Friday evening for a preview of the show. All the public play machines which had been set up were available to enjoy and most of the vendors' stalls were also open. Visitors entered the show through the café end of the Pavilion building where they first came upon the Pins Anon stand and entry desk. 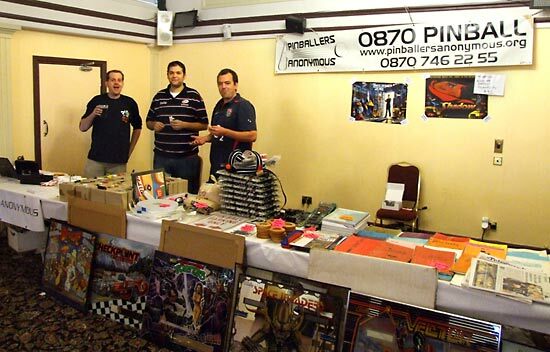 On the adjacent table were show sponsors The Pinball Heaven who had brought a varied selection of parts as well as three machines - a Stern Indiana Jones, a Stern Batman and a totally restored Bally Creature From The Black Lagoon. 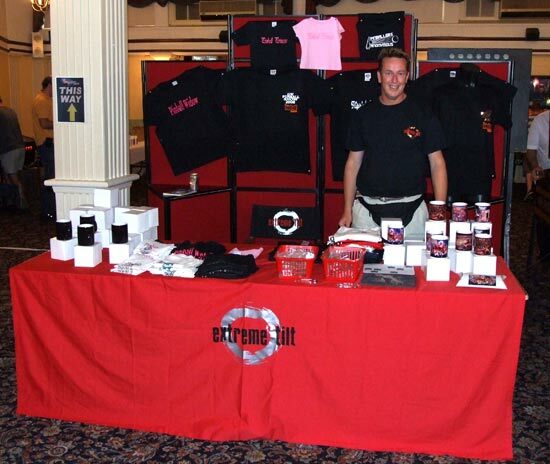 Opposite The Pinball Heaven and Pins Anon was Ian Thurston with his Extreme Tilt promotional merchandise. They were selling show t-shirts as well as various printed mugs and other assorted personalised products. The main corridor running the length of the building was soon lined with two walls of pinball machines. At one end of the corridor was the Pinball Palace/Pinball Wizard stand. Pinball Palace's Sean Mills was selling PinLED replacement boards and displays as well as subscriptions to Pinball Wizard magazine. 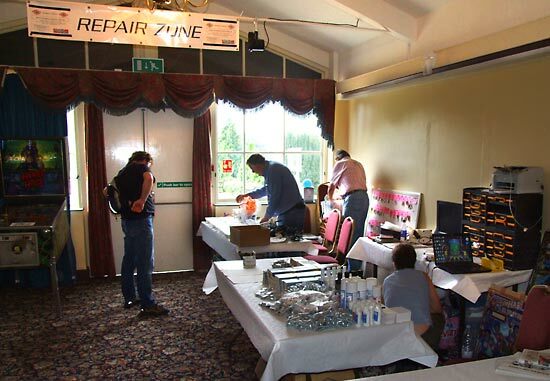 At the other end was the repair zone with Pinball Mania's Andy Netherwood, his wife Lisa and Baz and Dave. They were set up to repair machines if they failed during the show and also do on-the-spot board repairs, as well as selling a selection of spares and looking after machine keys. To the left of the Repair Zone was a selection of pachislo (Japanese electronic slot machines) from 777 Heaven. Next to them were two tables - one featuring LED pinball lamps by Albert Mediallon's PinballLED.com. There was a number of LEDs on display and some bayonet and wedge bases so buyers could try the different varieties. 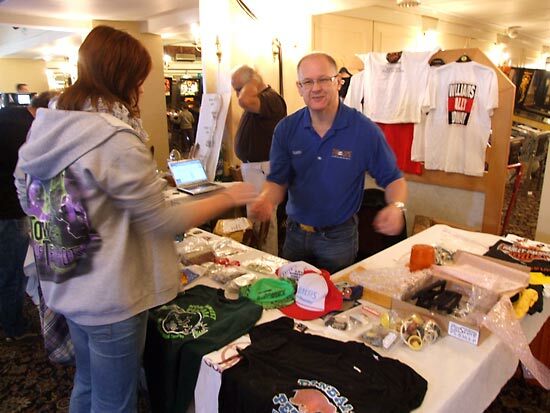 The second table was occupied by Gary Flower, who was selling assorted pinball parts, clothing and promotional items. With him on the stand for much of the day was the show's special guest, legendary game designer John Trudeau. By Saturday lunchtime, the number of machines had increased well over the magic 100 and reached a total of 131. Amongst the machines at the show were a good number designed by John Trudeau - 4 Creatures, 3 Brides and the most popular game, 5 Judge Dredds. But one of the more unusual games was a Gottlieb Spirit which John designed back in 1982. After not seeing one for more than 15 years, John was keen to have a game. 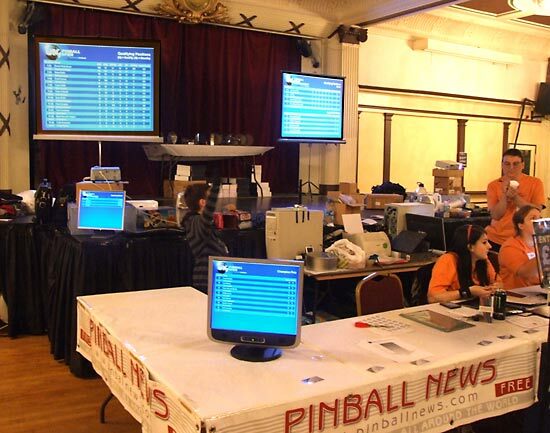 As in the previous three years, the Pinball News tournament team set up and ran all the competitive pinball events at the show. There were six separate tournaments held over the weekend in the area around the stage and wooden dance floor. 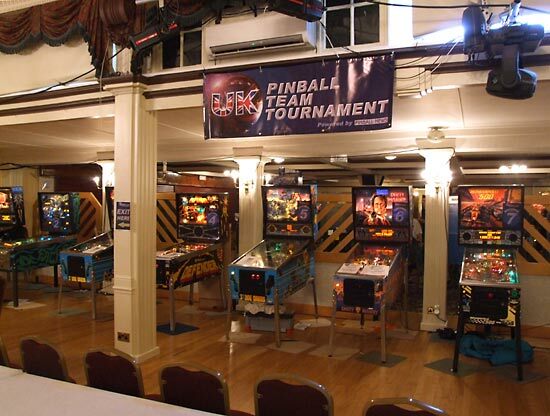 The layout of the tournament area had been adjusted slightly to bring the UK Pinball Open tournament into the centre flanked by the UK Pinball Team Tournament on one side and the UK Pinball League finals on the other. The fourth side of "Tournament Square" was made up by the tournament desk where players went to register and where they could see their progress on projector screens and computer monitors. The doors re-opened to the public at 10am on Saturday and it wasn't long before players were registering for the various tournaments. David Raison, Jayne Raison, Anne Raison, Adeline Prevost & Emily Raison. 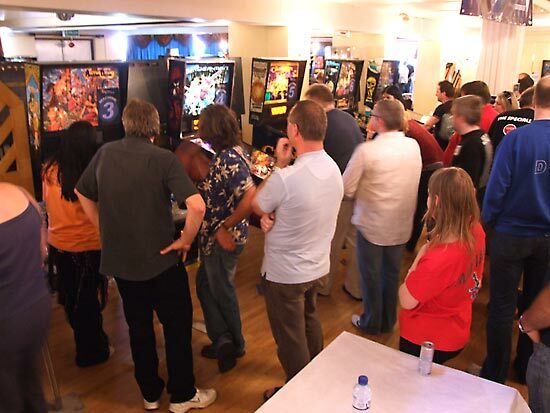 The UK Pinball Open qualifying round began at 10am with competitors playing a single three-ball game on each of the six qualifying machines. They were: Medieval Madness, High Speed 2 - The Getaway, Tales Of The Arabian Nights, Spider-Man, Champion Pub and Star Trek - The Next Generation. This format was unchanged from last year with players trying to secure one of the 20 qualifying places for Sunday's final rounds. If they succeeded, they would come up against the best 16 UK Pinball League players who qualified by coming at the top of their respective regional league in the 2007/8 season. Tournament head Richard Wade and Anne Raison took scores and sorted out any problems. As with last year's Open, score recording was done with wireless hand-held computers (PDAs) using the software devised by the Systems Team of Phillip Eaton and David Raison. As scores were entered on the PDAs, they were sent back to the main computers, put into the database and then returned to the PDAs, so players could confirm their recorded scores were entered correctly. A video projector showed everyone's qualifying position while a computer monitor showed all the scores on the six machines. Players' scores on each machine were ranked against all the other scores and ranking points awarded, with 100 for the top score and a sliding scale for lower scores. 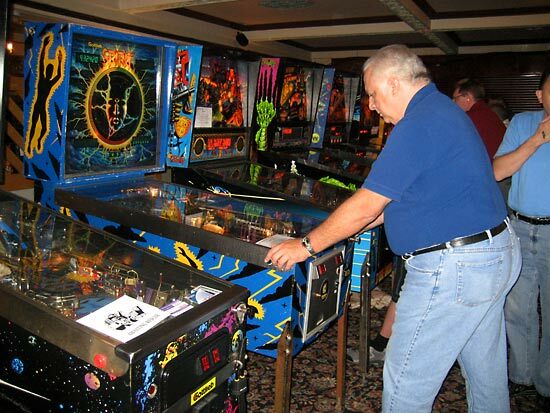 The machines could be played at any time during the day and in any order, but it was the competitor's responsibility to ensure they started all their games before qualifying closed at 5pm. The last games finished around 5:30pm at which time the top 20 players had qualified for Sunday's final rounds. Paul Jongma came first in the qualifying, getting the top score on three of the six machines. Players ranked 21-25 were also asked to return on Sunday morning in case some of the qualifying players did not turn up. 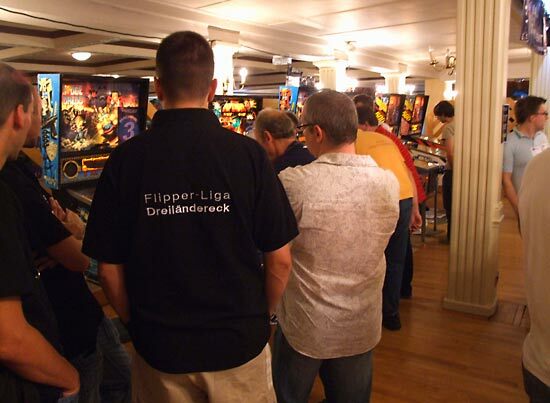 At 11am on Saturday the two tournaments either side of the UK Pinball Open began. 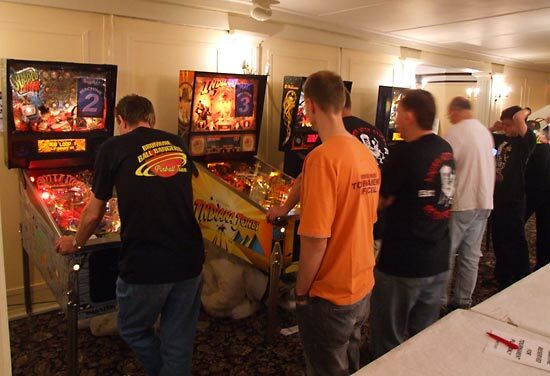 The UK Pinball Team Tournament was headed by Nick Marshall with Phil Dixon, Aid Cooper and Lee Fensom, and featured 16 teams of 4 competing on 8 machines. All the teams had pre-registered through the show website and paid £10 per team at the desk. The teams were divided into two groups - one starting at 11am and the second at 1pm. The Soapdodgers team was delayed in traffic on the way to the show and was therefore replaced by the Polish PSF team. Each team split into 2 pairs and played against 2 pairs from an opposing team in 4-player 3-ball games on 2 separate machines. The winner of each game earned 9 points for their team, second place got 5 points, third place got 2 points and last place scored no points. In honour of the show's special guest John Trudeau, the Team Tournament featured two Judge Dredd machines, both modified with the original ball lock on the ring around Deadworld. The machines were: The Shadow, Fathom, Judge Dredd 1, Defender, Judge Dredd 2, Dirty Harry, and a pair of Indianapolis 500. When teams were drawn on the Indianapolis 500 machines they played a single 4-ball game with each team member playing 1 ball. Every team played an Indianapolis 500 machine so all the scores were ranked on a sliding scale with the top team earning 15 points and the 9th team scoring a single point. Teams 10 - 16 scored no points. After both groups of 8 teams had played all their games, the top 4 went through to a final which was played in the same way as the qualifying. So The Mod Fathers, last year's winners the German Pinheads, Who Dares Pins and the Dutch Pinball Team went through to the final. Due to delays cause by late arrivals and missing team members, the final followed on immediately. In a tense series of matches, Who Dares Pins took an early lead ahead of the Dutch pinball team by 28 points to 20. The second set of matches add another 22 points to the Dutch total while Who Dares Pins only managed 10, giving the Dutch a 42-38 lead with the German Pinheads on 30 and the Mod Fathers on 18. 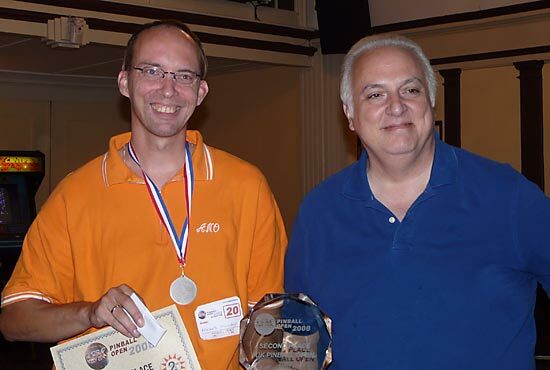 The final round saw the two leading teams sweep the board with the maximum 23 points each, keeping the Dutch 4 points ahead to win the UK Pinball Team Tournament by 65 points to 61. The German Pinheads were third with 39 points while The Mod Fathers were fourth on 27 points. - a complete reversal of the qualifying order. 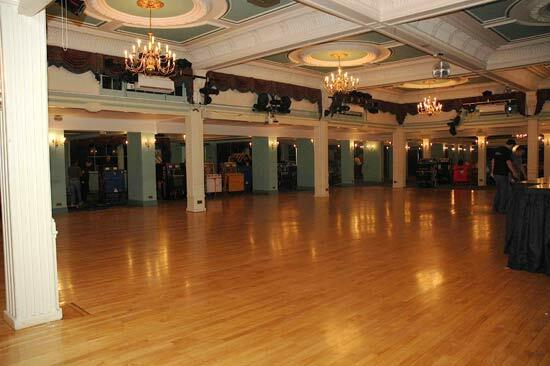 The tournament's awards ceremony was carried over to the following day due to the late finish and the hall closing at 6pm for the show dinner. 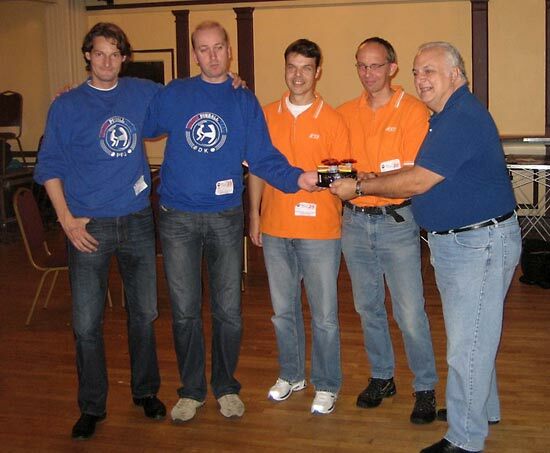 The Dutch Pinball Team received their individual trophies, their winners certificates, medals and the Lexx Trophy from John Trudeau. 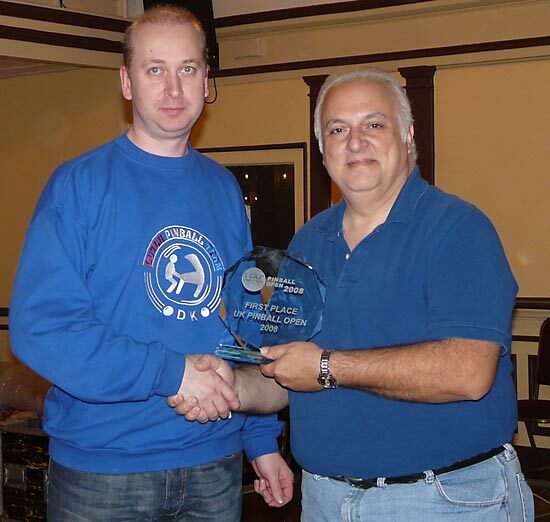 Meanwhile, on the opposite side of "Tournament Square", the final of the UK Pinball League was taking place under the stewardship of Greg Mott, Co-ordinator of the League. 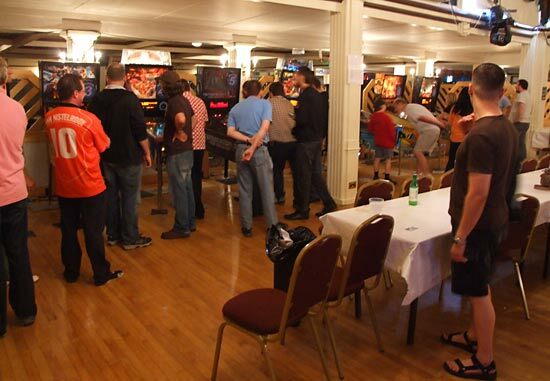 Last year this event was combined with the UK Pinball Open but this year the League had its own final on five machines. 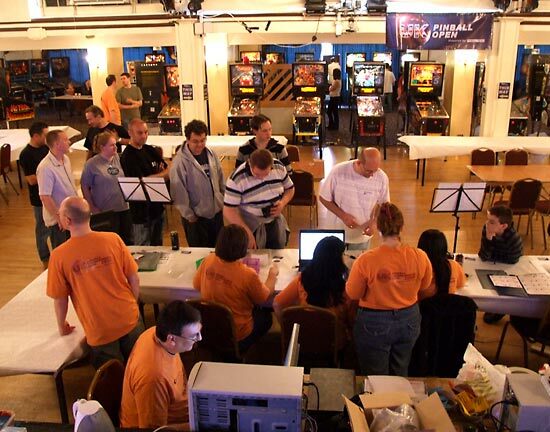 Because many of the 20 League finalists were also playing in the UK Pinball Team Tournament, there had to be some co-ordination between the two events which meant splitting the League players into two groups in the same way as the Team Tournament, so they could play first in one, then in the other. 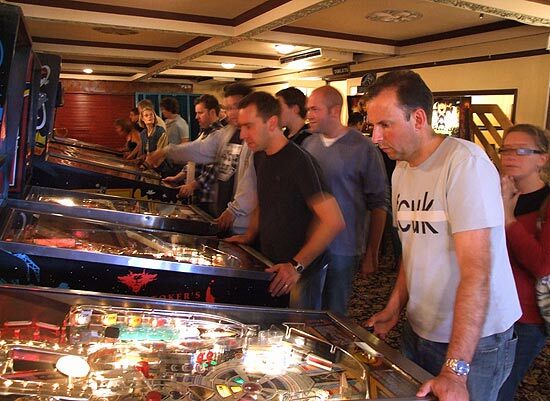 The final was run in the style of a regular UK Pinball League meeting using some of the 2007/8 season's most popular machines. Players paired up and played a 2-player 4-ball game on each of the machines. Players changed playing partner each time they moved to the next machine. The machines used for the League final were: Monster Bash, Scared Stiff, Indiana Jones, No Fear and Lord Of The Rings. Match details were posted around the area and overall rankings and individual machine scores were displayed on a laptop computer and external monitor. The 2nd to 7th places were only decided by the very last game on Lord Of The Rings but the League final brought a decisive victory for Garry Speight who got the top score on No Fear and was in the top half of scores on all the machines. Second place went to Adrian Donati ahead of Martin Ayub in third and Nick Marshall in fourth. 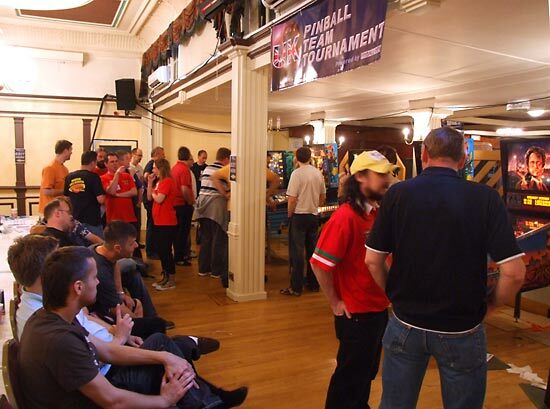 The fourth tournament on Saturday was the UK Pinball Kids Tournament which was run alongside the UK Pinball Open but played on a single machine - a Bally World Cup Soccer. Brothers Martyn and Tim Raison looked to have secured the top two places but in the last moments a storming game by William Moore took the lead with a 1.27 billion point score. William, Martyn and Tim all collected trophies, medals and certificates of merit. 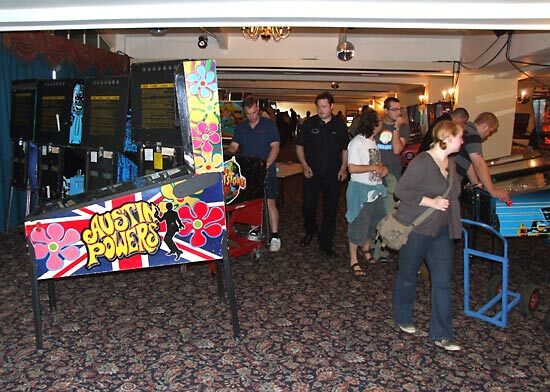 The show closed promptly at 6pm on Saturday as many visitors headed for the Kettering Park Hotel & Spa where there was an evening dinner with awards and presentation by John Trudeau on his life in pinball. Diners arrived from 7pm for drinks with the dinner starting at 7:30pm. All the diners were given complimentary copies of the latest Pinball Wizard magazine who had paid for the evening's special guest John Trudeau to fly over from Chicago. 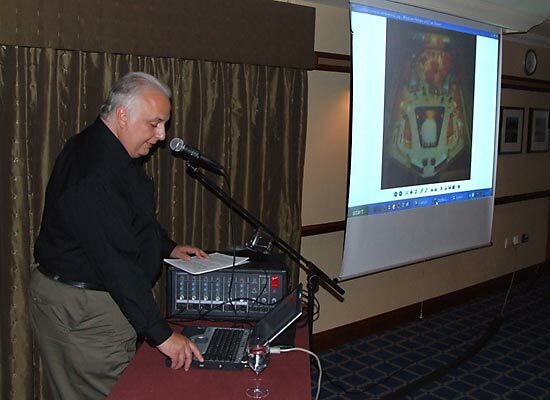 The evening began with an introduction and welcome by Nick Bennett followed by the 3-course meal, after which John gave his presentation. John began by explaining how he got into pinball by answering an advertisement for a game designer at Game Plan. He then talked about each of the games with which he was involved, describing interesting details and recalling stories about the game creation process and the various people involved at Game Plan, Gottlieb, Mylstar, Premier and then Williams. He concluded his talk by showing a trail for baseball on Fox Sports, based on a virtual pinball machine with baseball players on the playfield. John designed the playfield layout for the spot. Following his presentation John answered questions from the audience. You can hear John's presentation and the question & answer session from the UK Pinball Show by clicking play below. Got problems hearing the audio? Consult our help page for assistance. 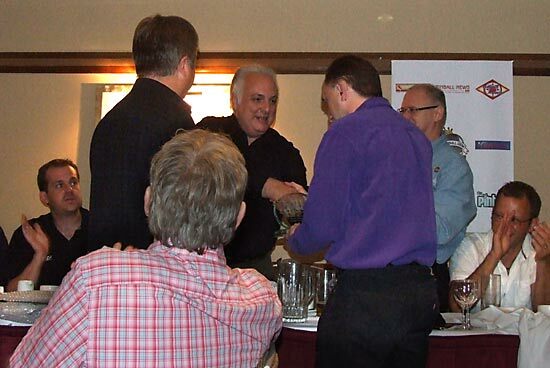 After his presentation, John returned to the table and presented a number of awards. The first was for the best pre-1990s game at the show, sponsored by the Pingame Journal. The award was split between Mark Squires for his Bally Fathom and Peter Blakemore for his Gottlieb Spirit shown above. 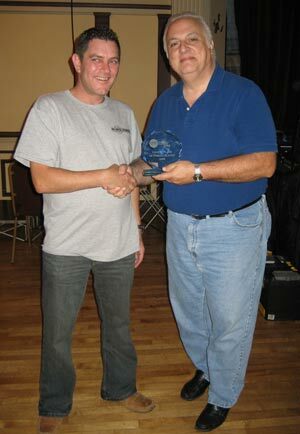 There was then an award for the best DMD pinball sponsored by Clint's Amusements which was won by Stan Simpson for his Medieval Madness. One worthy winner of a "best in show" trophy would have been Roger Thornton's Bride of Pinbot, but sadly by being a 1991 non-dot matrix game, it didn't qualify for either award. Another possible contender was Phil Palmer's restored Creature From The Black Lagoon. However, since it was for show only and not for play, plus Phil was sponsoring the show, it was excluded from consideration. Next came the first few inductees to the new UK Pinball Hall Of Fame. These were chosen by Nick with suggestions from UK Pinball Group members. The first to enter the Hall Of Fame was the evening's guest speaker John Trudeau who was also at the show all three days where he chatted with visitors and signed various products before presenting the multiple tournament awards on Sunday. 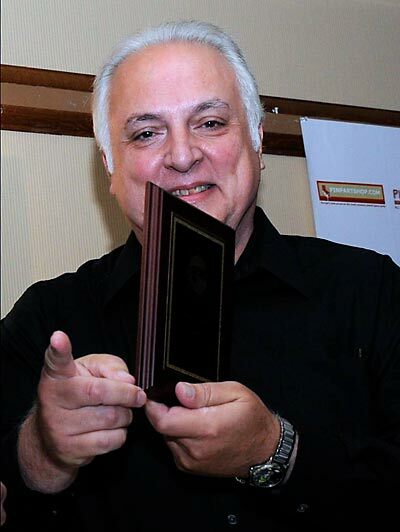 The next inductee was Pinball News Editor, Martin Ayub. 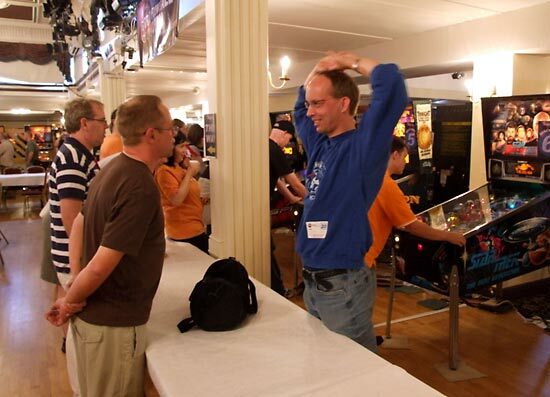 Martin heads up the team who run all the tournaments at the show and runs the UK Pinball Group as well as traveling to - and competing in - numerous pinball events overseas. 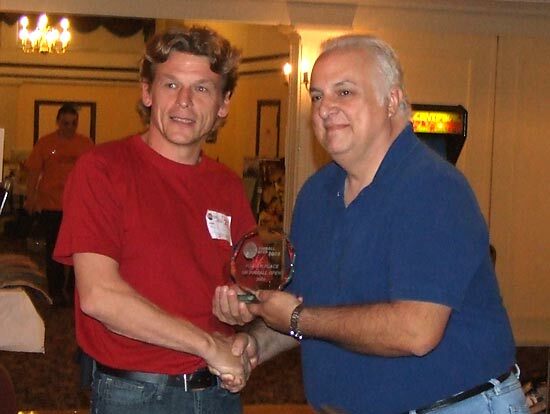 The third inductee into the Hall Of Fame was Pinball Mania's Andy Netherwood. Besides running one of the most respected parts and repair services in the UK, Andy also donates his week before the show repairing and restoring games for the public to play and his show weekend fixing games when they break. 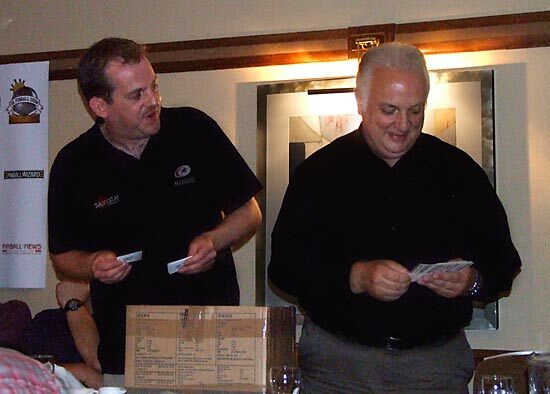 At the end of the awards, an ad-hoc raffle was held for a number of promotional postcards for Premier's Rock game, donated by John. All the name cards were put in a box and drawn at random. 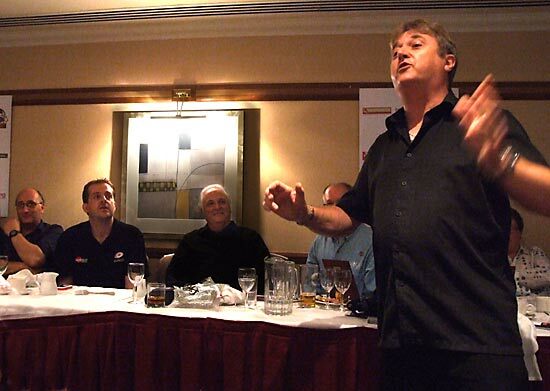 Surprisingly, the first names drawn out of the box were nearly all from the evening's earlier award winners - something that provoked some light-hearted jeers - but it wasn't long before dinner guests from all around the room were coming up to receive their cards from John. Mark Squires - who was so influential in getting the UK Pinball Show off the ground through Nokia's sponsorship and support - stood up to describe how the show was the perfect demonstration of how an online community such as the UK Pinball Group can take a bunch of electronic messages and extrapolate them to create something real and exciting like the show. He said the Group's achievements were influential in the development of Nokia's Social Media network. With Nick spending the evening giving out awards and honouring some of the other people who make the show happen, it was time for Nick himself to be on the receiving end of everyone's gratitude. 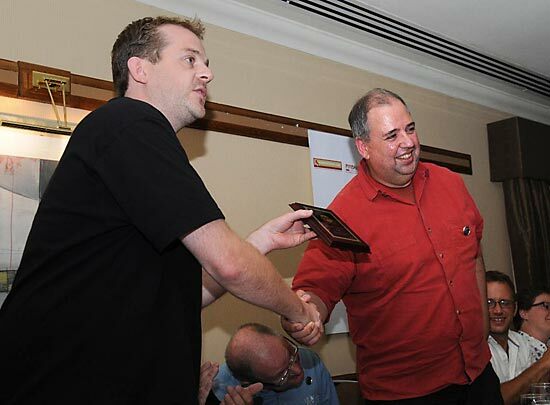 First, as John presented him with his former Williams Pinball ID patch and then as Mark led a chorus of "For he's a jolly good fellow" sung by the whole room. All of which brought the dinner to an end. 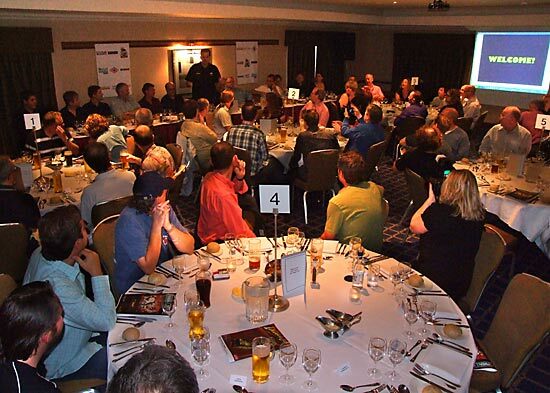 As Nick thanked everyone for supporting the inaugural awards dinner, diners left the room to continue their conversations over a drink in the hotel's bar. Sunday morning, and the show resumed at 10am for another 8 hours of play, shopping, chat and tournaments. Just as the show reopened G-man took his video camera and made a 6 minute long tour of the show which you can watch by clicking below. Got problems seeing the video? Consult our help page for assistance. 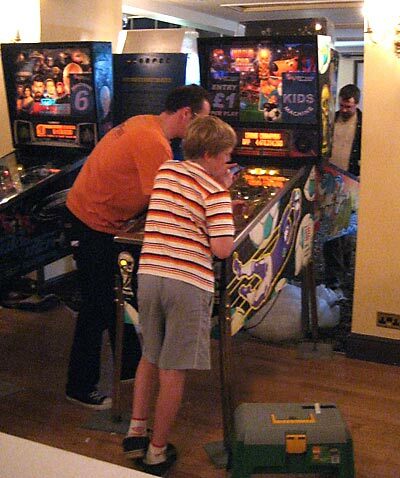 The first tournaments of the day were the UK Pinball Classic and the Sunday UK Pinball Kids Tournament, both run by Mike Parkins and Dave Edwards starting as soon as the show opened and running until 3:30pm. The Classic was a new tournament added for those visitors who could only make it on Sunday as well as those who missed out on qualifying for the Open. 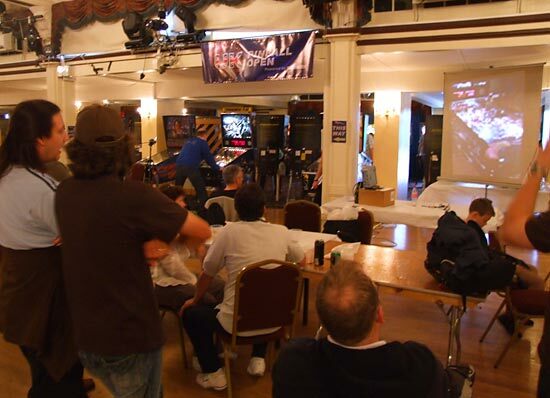 Although the tournament was new, the format was a tried and tested one from the first two UK Pinball Shows. Competitors chose any of the four machines to play and tried to get the higest score of the day. The machines all electronic with one dot matrix game - Corvette, one alpha numeric - Bride Of Pinbot, one Williams solid state - Defender and one Bally solid state - Fathom. Players could enter as many times as the liked and when the qualifying round finished at 3:30pm, the highest scorers on each went into a final held on a Stern Lord Of The Rings. After a steady few hours, the tension really built up towards the close as players made a last ditch attempt to grab the top spot. When qualifying closed, the qualifiers for the final were: Albert Medaillon (Defender: 1,538,080), Ad Jonker (Fathom: 1,940,680), Brenn Oosterbaan (Corvette: 1,789,084,240) and Paul Jongma (Bride Of Pinbot: 1,410,840,390). Unfortunately, Ad had to catch his plane home before the final and so second placed on Fathom Aid Cooper took his place in the final. 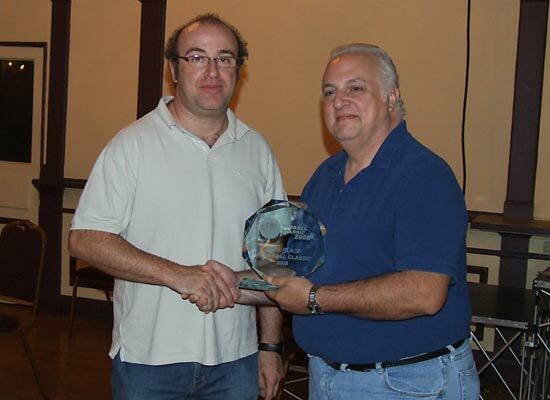 The showdown on Lord Of The Rings was a close affair with no player storming ahead with a massive lead, however Albert Medaillon took the lead with his final ball total of 40,952,510 and took home the first place trophy, certificate and medal. Second place was secured by Brenn Oosterbaan with his score of 34,708,460 coming home ahead of Paul Jongma's 30,149,410 and Aid Cooper's 13,714,800. 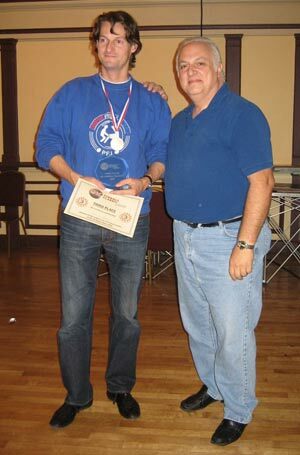 So Albert Medaillon is the first UK Pinball Classic champion and he received his well- earned rewards from John Trudeau. 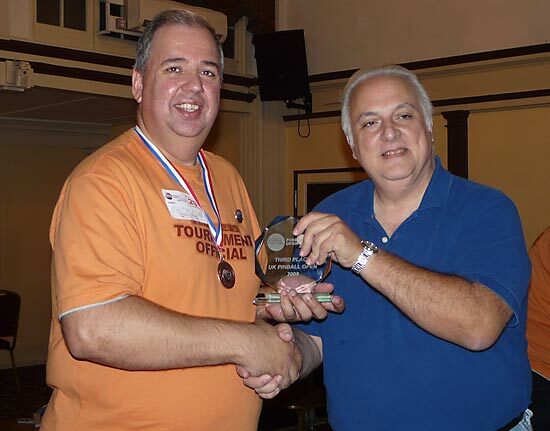 Following the presentation to the UK Pinball Classic winners, Greg Mott - Co-ordinator of the UK Pinball League made a number of awards to the winners and top placed players in the regional League sections. Following the regional awards, the trophies were presented to the winners from yesterday's national League final. Finally, the best women and junior players over the past 12 months were also honoured with trophies and medals. 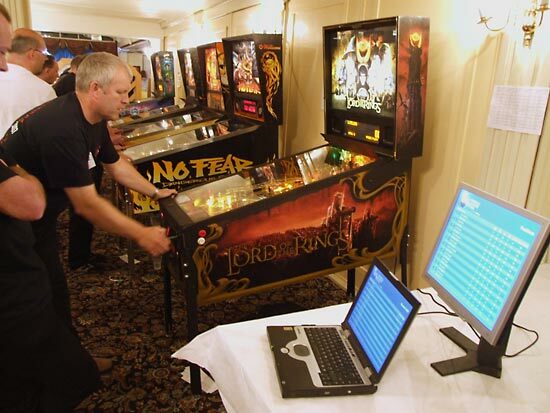 Running alongside the Classic was the Sunday UK Pinball Kids Tournament also played on the same Lord Of The Rings as the Classic final. It too concluded at 3:30pm and which point the top scorer was declared the winner. As on World Cup Soccer the previous day, William Moore from the Isle of Wight took the honours with 39.6M. In second place was Tim Raison on 26.1M who improved one place from Saturday. Third was another William, William Healy with his 18.6M points. 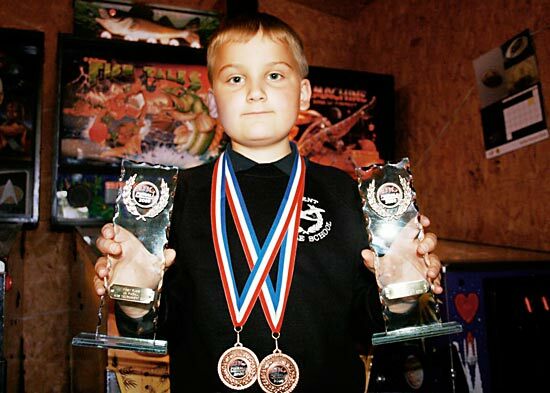 All three received trophies, certificates and medals, while William's dual victory was duly reported in his local newspaper. Over on the opposite side of the tournament arena, the first round of the UK Pinball Open finals began with 36 competitors taking part. The first round was split into two groups. The first began at 11am and was made up from qualifiers 11-20 from Saturday and the bottom 8 pre-qualifiers from the UK Pinball League. The second group played two hours later at 1pm and comprised the top qualifiers both from Saturday and from the League. Two players failed to arrive in time are were substituted for stand-by qualifiers Tom Loomans and Mike Grant. The format for the first round was unchanged from last year and the same for both groups of players. There were nine machines and the 18 players paired up to play 2 x 2-player 3-ball games, taking turns to be player 1. Only the player's best score from the two games were recorded, their lower score being discarded. The machines used were: Lord Of The Rings, Attack From Mars, No Fear, Whitewater, Terminator 3, Fish Tales, Judge Dredd, Indiana Jones & Scared Stiff. 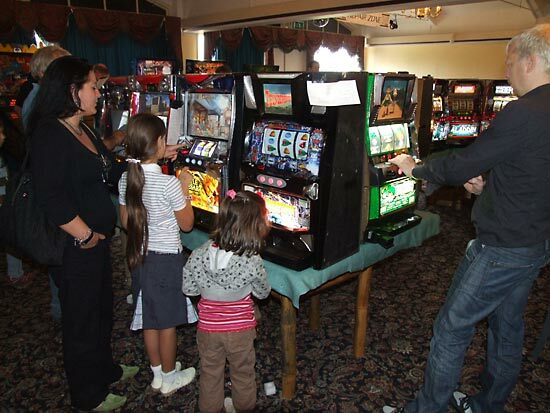 Once the two games had been played, everyone moved onto a different machine and played a different partner in the same way. They then did this a third time to complete their first round play. Before each new machine was played, everyone was given 30 seconds of warm-up time to get a feel for the shots, the angles and the tilt sensitivity. One game in particular - the Attack From Mars - suffered from the overly springy floors around it. While it played fine during setup and testing, once all the players were standing around it and moving about, it became amazingly sensitive. As the scores were entered into the system through the PDAs, all the scores on every machine were ranked to give 100 points to the highest scorer and a sliding scale for players with lower scores. Each player's ranking points on their three machines were added up to give their overall total and position. The first group ended just before 1pm and after a brief pause the second group played their matches in the same way as the first. Both groups' scores and ranking points were combined so all 36 players were ranked together. Some early leaders from the first group saw themselves drop down the rankings as the second group started playing and everyone's fortunes waxed and wained as more and more players slotted in either above or below them. The second group also finished on schedule at 3pm by which time the full positions and the 8 qualifiers for the semi-finals were confirmed. The top eight who had qualified then played in the semi-finals, held on two machines - Dirty Harry and Indianapolis 500. The odd-numbered qualifiers played DH, the even-numbered played I500 in a 4-player, 3-ball game with the top two going into the grand final. That put Eric, Martin, Albert and Dirk into the final, played on a new Stern Batman machine. The 5-ball game started with the first player - Holland's Dirk Klaver - running up a large total during his lengthy first ball followed by fellow countryman Albert Nomden with Martin and Eric battling over third place. This was to prove the pattern for the rest of the game as Dirk extended his lead through a series on long duration balls, finally passing the 200M mark on ball 5. Albert, meanwhile, maintained his second place throughout with the ever-present threat he might really hit the mark and put on a major surge at any moment. Third place was decided on the final ball as Martin's 84M total looked to be in danger from Eric as he started his last ball on 78M. It was not to be though, leaving Martin in third and Eric in fourth. In all, the game lasted over an hour and a half leaving several people wondering how operators could make money with a game which, despite having maximum width outlanes and a 7.5 degree pitch could be played for so long. The Batman game won a lot of admiring comments for its looks and gameplay though, with the newer software filling in many of the gaps in the rules found in earlier versions. 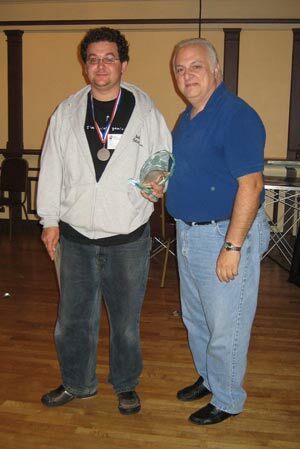 So Dirk Klaver wins the UK Pinball Open 2008 and collects a trophy, certificate, medal as well as 50% of the Open registration fees. 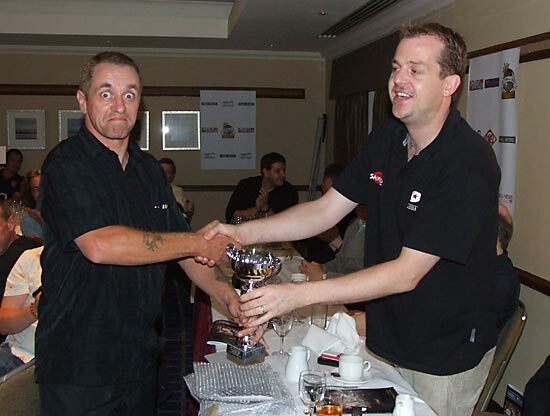 Since the time was now 6pm, the trophy presentations brought the UK Pinball Show to a close for 2008. It was then time for the visitors to leave and everyone else to clear the building of machines, computers, trolleys and lots of boxes, to load up the vans, drive them home and unload it all again. 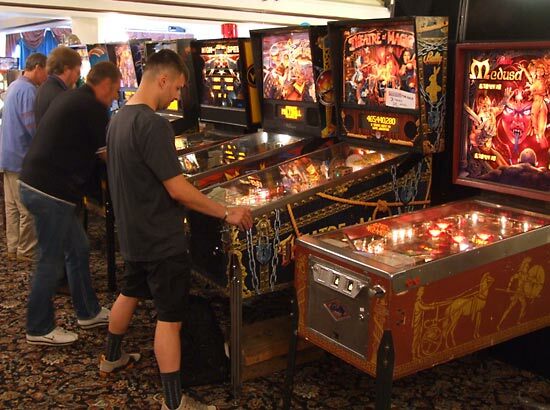 The UK Pinball Show had certainly become a regular and established part of the pinball scene in the UK but now its appeal is starting to widen beyond its home country. 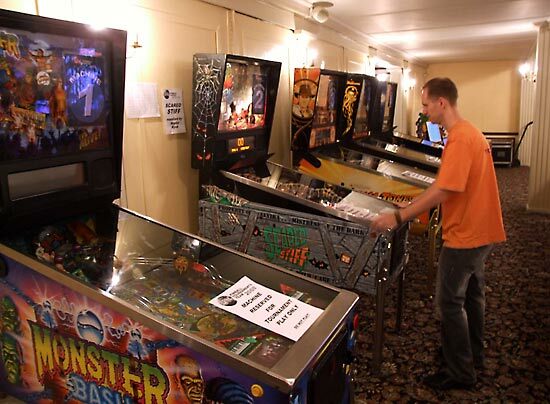 Part of that can be attributed to curiosity about next year's European Pinball Championship which is being held in the UK, but the prospects of WPPR points and over 100 machines on free play might also be behind visitors from The Netherlands, Germany, France, Belgium and Poland making the journey to Kettering. This second show at Wicksteed Park was a genuine improvement over the first and while the number of machines may have been slightly lower (by 17) the overall quality was much improved and junk machines had all but disappeared. A greater mix of older machines would be appreciated by many, although the proliferation of high quality popular titles was certainly good to see. There were also hardly any power issues this year and the set up time on Friday afternoon allowed for a more relaxed show, and an additional public session on Friday evening. 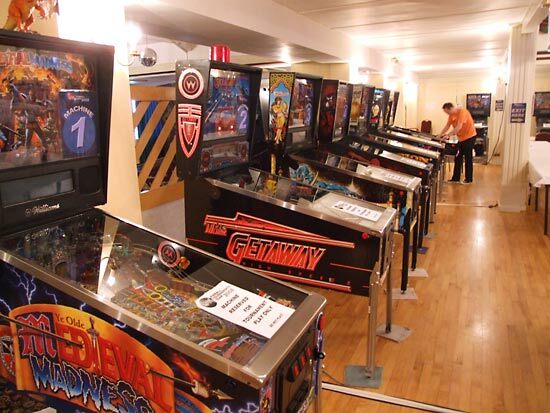 The show still evolves with each passing year and next year's EPC will see it change again but despite - or even because of - all the other pinball activities taking place in the country it is, now more than ever, the showpiece of the UK's pinball calendar.